So, it’s Christmas time. You’re having a bit of food with your friends and family. Well, a lot of food. It’s Christmas, isn’t it? It’s all very convivial and jolly and all that. Suddenly, there’s a commotion at the door. A big chap has come in. He’s on a horse. He’s a really big chap. He challenges the room for one to come forward for a game. A Christmas game. It seems to involve a big axe. A really big axe. What do you do? Do you accept the challenge? This guy looks like he can handle himself in a fight. This guy and his horse are, incidentally, both, completely, from top to toe (hair, mane, beard, tail, clothes, and skin), completely ‘enker grene.’ Yup: enker grene. Bright green. There we have the opening set-up for the anonymous, fourteenth-century poem Sir Gawain and the Green Knight. Of course, it’s not you and your friends who are tested. It’s Sir Gawain and the rest of Arthur’s court at Camelot. But that’s essentially the same, right? 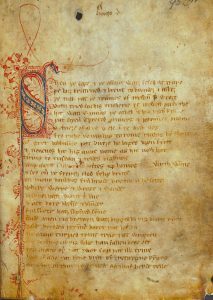 Written in a Middle English dialect of a region around Staffordshire, Derbyshire, and Cheshire, Sir Gawain and the Green Knight tells the tale, in rollicking alliterative verse, of the results of the Green Knight’s game. For anyone wishing to read the poem, there are excellent modern editions of the original text, as well as a superlative and re-creative translation by Simon Armitage. How Christmas fits in is clear: the commencement and climax of the poem occur at that time of year. But this is Advent Botany. Where’s the botany at? The knight is indeed green. What does that mean? Is he a plant? Is he a photosynthesising festive mammal? Synecdoche for the natural world? One line of interpretation which might seem immediately attractive is to link this literally green man to the folkloric Green Man, that anthropomorphised tree-figure represented in stunning carvings such as those in Salisbury Cathedral and Tewkesbury Abbey. He is, after all, green. His size is of the proportions approaching a mighty tree. He’s described as ‘half etayn’ (half giant), the word from which J. R. R. Tolkien drew his name for the ‘Shepherds of the Trees’ in The Lord of the Rings, the Ents. The Green Chapel, a vegetation covered chasm, is his lair. Perhaps we might even draw an association between the Green Knight and the Holly King, the tree spirit of folklore who fights with the Oak King for dominion over the woods (a contest which brings about the changes of the seasons, with the Holly King for winter and the Oak King for summer). It is even tempting to suggest that the Green Knight’s ability to survive beheading is a parallel to the ability of trees to be pollarded. If so, which species is he? Holly (Ilex aquifolium) is a possibility, with the pollard hollies of the Stiperstones in Shropshire springing to mind. The straightforward reading of the Green Knight as a sylvan spirit is, therefore, not really supported. Further, the greenness of the Green Knight may possess other connotations than just the natural world. The fourteenth-century ‘green’ was not the same as modern environmental ‘Green’. For example, green was frequently the colour of demons and the Devil himself. The Green Knight’s green appearance is brought about by the magic of sorceress Morgan le Fay (King Arthur’s half-sister) to provide a trial of Arthur’s knights (and, ideally, kill Guinevere with fright). The Green Knight is in fact Sir Bertilak, transformed. Perarhaps the Green Knight is less natural and more super-natural. And an axe in his other, a huge and unmete’. Of hore okes ful huge a hundredth together. with rogh raged mosse rayled aywhere’. Old oaks (Quercus sp. – possibly, in the uplands of the north-west, Q. petraea), Hazel (Corylus avellana), and hawthorn (Crataegus sp.) get a specific (or generic…) mention. The ‘raged mosse’ is, as is unfortunately often the case, skipped over as background. Imagine how good the bryophytes of a fourteenth-century upland oak-wood would be! Such details of the natural world are not superfluous. But, as we have seen, they likewise do not tell the whole story. The overriding sense (from even this far from exhaustive survey) is the multifaceted character of the Green Knight. And whilst it might not be the most academically rigorous line to take, I welcome the fact that renewed interest has frequently highlighted a wondrous poem and the wondrous natural world. As long as we steer clear of that slippery phantom of authorial intent and the too rigid back-reading of modern ideas and folklore, who am I to say, who is anyone to say, ‘You can’t interpret it like that’. So, take this Christmas as an opportunity to read this poem and use it as inspiration to get out in this dark time of year and explore ‘a forest ful depe’ and ‘wylde’. Armitage, S, 2007. Sir Gawain and the Green Knight translated by Simon Armitage, Faber and Faber. Burrow, J.A., ed. 1972. 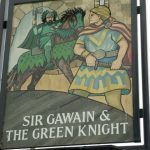 Sir Gawain and the Green Knight, Harmondsworth: Penguin. Larrington, C., 2015. The land of the green man: a journey through the supernatural landscapes of the British Isles, London. 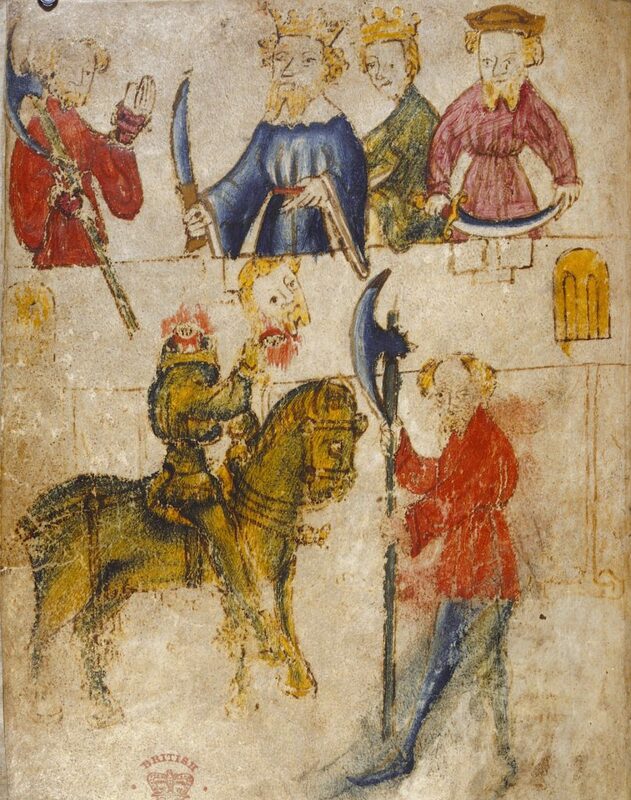 In short(ish), Gawain agrees to exchange axe-blows with the Green Knight. Encouragingly for Gawain, he gets to go first. He cleaves the Green Knight’s head from his shoulders. This doesn’t seem to perturb the Green Knight, who merely walks over and retrieves his head and rides off, reminding Gawain of his promise to meet him in ‘twelmonyth and a day’ (l.298) at the Green Chapel in order to allow the Green Knight to take his swipe. We follow Gawain as he searches across the wilds of the Wirral for the Green Chapel. There’s a humorous romantic subplot when Gawain is given shelter and hospitality by Sir Bertilak at his castle involving Gawain, Bertilak’s wife, and a magical green girdle. Gawain finds the Green Chapel and faces the Green Knight. After much tension, the Green Knight decides to spare Gawain and, in a breakneck (though importantly not literally), deus ex machina-style twist, reveals himself to be Sir Bertilak, transformed by the sorceress Morgan le Fay (King Arthur’s half-sister) to test the bravery of the knights of Camelot and, hopefully, scare Guinevere to death. Gawain returns to Arthur’s court and all is well. Something which may have encouraged readers to view the Green Knight as a similar character. The ‘real’ location of the Green Chapel has been suggested to be Lud’s Church in the Peak District. This claim cannot really be proved or disproved. Either way, it’s a beautiful place to take a walk. Raglan, J. 1939. 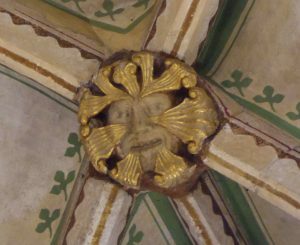 The Green Man in Church Architecture. Folklore, 50: 45-57. C. Larrington, 2015. The land of the green man: a journey through the supernatural landscapes of the British Isles, London, p. 227. Given our currently sparsely woodland uplands, we may also be intrigued by the wooded ‘High hilles’ and speculate if this was an accurate representation of their state in the fourteenth-century. A palaeoecological reconstruction of the environment of Sir Gawain could be a rather fun project. This entry was posted in Advent, Herbarium RNG, MSc Plant Diversity, Public Engagement with Science and tagged #AdventBotany, #AdventBotany2018. Bookmark the permalink.